Want to make a great Halloween snack parents can enjoy too? Let’s face it, most treats this time of year center on kids but think about that for a minute. We spend a lot of time hauling kids from house to house so they can get a bag of free candy that they won’t even share with you, is that fair? Or worse you spend the night at home praying you don’t run out of candy, so you don’t eat any of it, again not fair! Adults need something, perfectly suited to us, for us, by us. 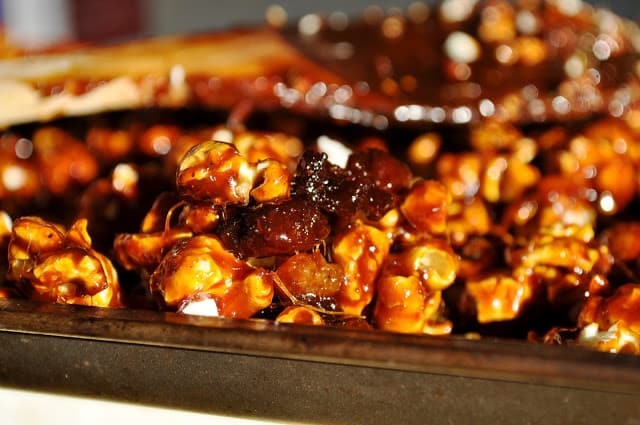 May I introduce Spicy Caramel Bacon Popcorn? 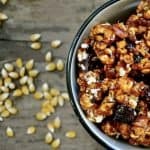 I love the sweetness of caramel in a popcorn. Gotta try this! Dangerous. That is all- so good! Lets face it…bacon just makes everything better 🙂 PINNED! This sounds just interesting enough to try it. Thank you for sharing at Friday Frenzy.